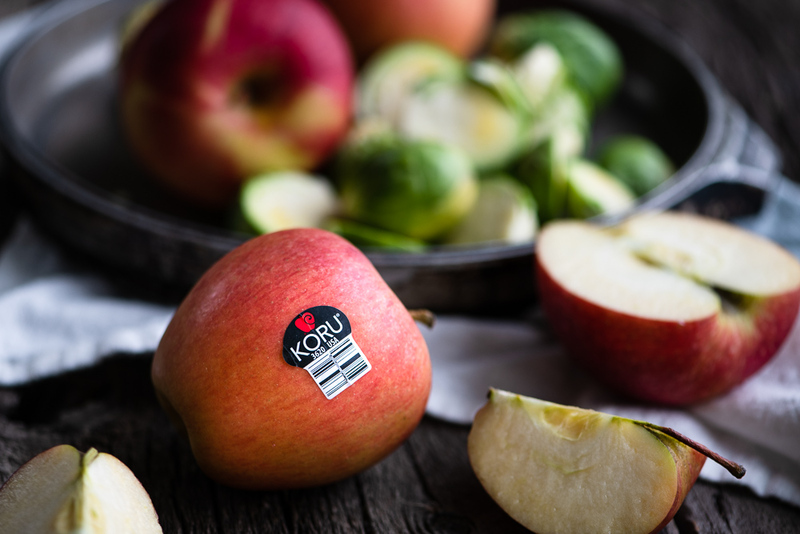 KORU® apples are the perfect addition to this warming winter bowl brimming with roasted vegetables, superfood quinoa, protein-packed chickpeas, and topped with a creamy tahini-miso dressing. Save yourself some hassle by prepping ingredients ahead of time. You can also cook more quinoa and chickpeas than required in order to have them on hand for future recipes like this breakfast quinoa with warm honey pears or our butternut squash and pear soup with spiced chickpeas . Take it from us, batch cooking makes life so much easier! Place the sweet potatoes and Brussels sprouts on a baking tray. Drizzle with olive oil and sprinkle with salt and pepper. Toss to ensure all vegetables are coated and the salt and pepper is evenly distributed. Place the chickpeas on a second baking tray, drizzle with olive oil and sprinkle with cumin, paprika, salt and pepper. Toss well so chickpeas are coated, and salt and spices are evenly distributed. Put both trays in the oven at the same time, with the vegetables on the top rack. Bake for 15 minutes. While everything is roasting, make the creamy sauce. Place the tahini, miso and lemon juice in a small bowl and whisk until smooth. Add one tablespoon of warm water and whisk again. Continue, adding one tablespoon of water at a time, until the consistency is creamy and quite fluid, but not runny. Set aside. Take the chickpeas out of the oven and set aside. Toss the vegetables and bake for an additional 10-15 minutes, or until cooked through and browned at the edges. Warm the cooked quinoa and divide into two bowls. Spread using the back of a spoon to create a bed of quinoa at the bottom of each bowl. 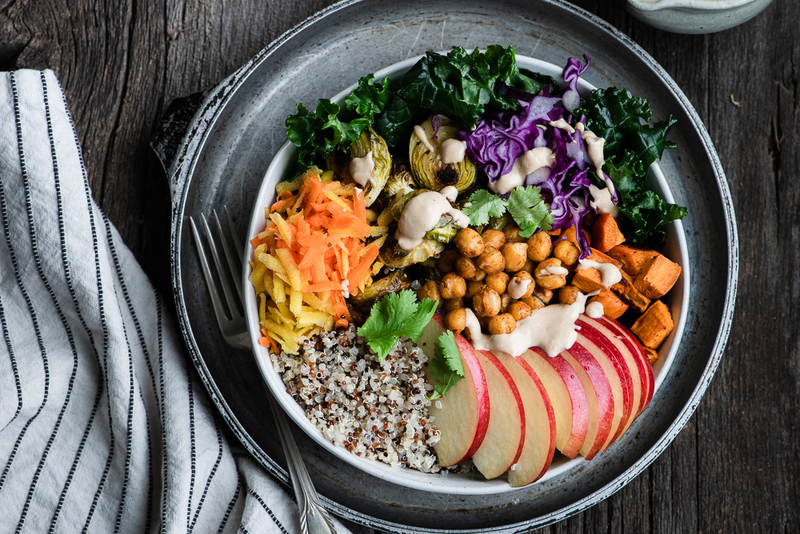 Divide the roasted sweet potato, Brussels sprouts, kale, apple, shredded carrot and cabbage between the two bowls, taking care to layer ingredients over the quinoa. Garnish with roasted chickpeas. Drizzle generously with the creamy tahini-miso dressing and sprinkle with chopped cilantro.